Minimally Invasive Surgery became popular in 1988 when patients recovered quickly and safely from Laparoscopic gall bladder surgery. Instead of taking weeks or months, these patients recovered within days. The gall bladders were removed after making several small, 5 mm to 10 mm incsions to insert a laparoscope/ miniature camera into patient's abdomen. Medicine has since evolved allowing surgeons the ability to use Minimally Invasive Surgery for many different surgical procedures instead of the traditional "open" surgery. By using state-of-the-art technology, the surgeon can make several small 3/4 inch incisions to insert thin tubes called trocars. The surgical area is inflated with carbon dioxide gas creating area between the internal organs and skin. A miniature camera which is a laparoscope or endoscope is placed through one of the trocars. 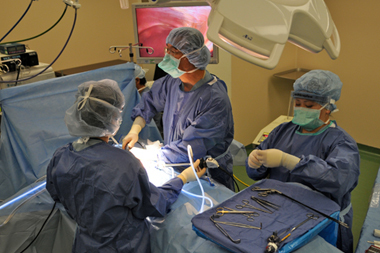 The magnified image is then viewed by the surgeons on video monitors placed in the surgery room. Different Minimally Invasive Surgeries can require larger incisions or even no incisions or trocars depending on the surgical procedure. It is best to discuss the procedure appropriate for your condition and if you would be a surgical candidate for Minimally Invasive Procedures.